ZeroWater is not an ordinary water filter! ZeroWater delivers a unique 5-Stage Ion Exchange technology compared to conventional 2-Stage filtration. Enjoy the purest tasting water with a filter that removes 99.6% of TDS (total dissolved solids) from your tap water, such as Aluminum, Zinc, Nitrate, Fluoride and more! 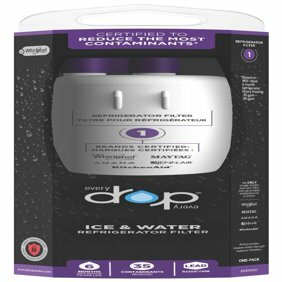 It is the only water filter that meets FDA standards for TDS in purified bottled water. This provides you with a pour-through, gravity fed filter certified by the NSF to reduce Lead and other heavy metals; such as Chromium 3 and 6. This 30-cup dispenser features a push-and-pour spout so you can conveniently fill your cup with one hand. You will know when its time to change your filter as every pitcher comes with a water testing meter, which measures the total dissolved solids in your water. 30-cup, largest capacity dispenser. One-handed push to dispense spout to fill any bottle or cup. Built-in TDS meter holder. 7-cup reserve. ZeroWater is not an ordinary water filter! ZeroWater delivers a unique 5-Stage Ion Exchange technology compared to conventional 2-Stage filtration. Enjoy the purest tasting water with a filter that removes 99.6% of TDS (total dissolved solids) from your tap water, such as Aluminum, Zinc, Nitrate, Fluoride and more! It is the only water filter that meets FDA standards for TDS in purified bottled water. This provides you with a pour-through, gravity fed filter certified by the NSF to reduce Lead and other heavy metals; such as Chromium 3 and 6. This 30-cup dispenser features a push-and-pour spout so you can conveniently fill your cup with one hand. You will know when its time to change your filter as every pitcher comes with a water testing meter, which measures the total dissolved solids in your water. 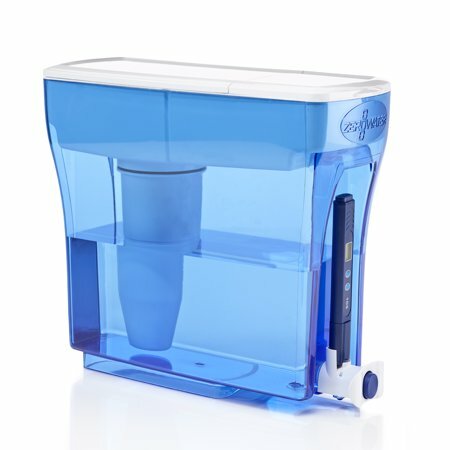 Since my good health and the health of my family is priority one in my household, my ZERO WATER filter is a must have. I have been a loyal customer/ user of the product line for over 12 years and would not be without. I have given as gifts and every family member has a Zero Water filter. I also give the water to my animals in hopes of extending their lives. Thank you for a quality product. I purchased this last month and my loving family and I are absolutely amazed with how great the water tastes. We purchase deer park water at the store, but no more. Nothing compares to zero water!! My dog loves it also! I bought a rather expensive coffee maker and Zero Water does a great job of preventing solids from forming on the heaters. If you want your coffee maker to last using Zero Water is the best way to do it. I've been using this product for about 3 years now. I preach it to anyone who is looking to remove flouride, heavy metals. Plain just make your water clean and healthy.. Problem with filling each sucessive attempt. I purchased this product as an upgrade from smaller zero water pitcher. Installed filter and added water. The product filled completely, each consecutive attempt the water would fill from filter but progressively amount would stop lower. It now only fills 3 inches. Why? To alleviate this it is best to lift the filter and reservoir out of the pitcher or dispenser and tap the side of the filter using moderate force to help break up the air pocket. Then take just the filter & reservoir to the sink and put about an inch of water into the reservoir and allow that to run through the filter and right into the sink to displace and dispel the air pocket. After that has completed then return the filter and reservoir to the pitcher or dispenser and continue to filter water as normal. We received the 30-cup 3 days ago. At first, TDS was in the tens out of the filter. Today, water inside the pitcher is above 60. It turned out that droplets were coming out of the filter past the first stage. After tightening the filter screw and holding the top portion over a glass, 00 TDS finally drips in. Hopefully this fixes it. The lid was a problem from day 1 also. The two parts arrived disconnected, and are supposed to fit together by 2 plastic hinges. They are very hard to push together, and one piece broke off while trying to. Now, the remaining hinge can slide in sideways and the lid lays flat. Overall, the water tastes good, and has the potential to filter down to 00 TDS, so I guess it does its job. It is compact, but fits a good amount of water. However, you can expect to have some problems that you have to fix yourself. I started with a very positive predisposition (trying to get my family onto reusable bottles), but even I can't say this product is beyond improvement. Hello, We are sorry to hear of your experience with your lid and will be reaching out to you. We are glad to hear that tightening the filter resulted in the 000 reading for your filtered water. I bought the Zero Water 23-cup dispenser about a month ago. Delivery was fast. The water tastes great. My first filter has lasted about a month. I have a couple of issues. The coupons enclosed to help towards the cost of the filters were out of date by a year and when I contacted the US office they attached new coupons but these can only be redeemed in the US! One of the reasons I bought this product was the recycling aspect of the filters and again, the $10 they offer to assist with sending the filters to them is only for the US. The filters are quite expensive and I plan to buy them in bulk (12) but as Walmart does not have them, I will have to purchase them elsewhere. This is actually my second zero water filter....u can taste the difference in the water right away. The one complaint I have about the filter is that the flap is really flimsy I actually broke it on my first one. My suggestion is just to remove the whole lid when filling with water. Also to anyone buying this filter please keep it in the fridge don't keep it on ur countertop... so u can prevent the growth of bacteria. Thank you for your review. Your feedback on the lid design is greatly appreciated. We are in the process of reviewing the lid design for the 23 cup dispenser. After I bought the Zerowater Dispenser my family drinks water only from it. Water quality was good. My TDS reading is always 2 but that's totally acceptable to me. My issues are no matter how full I fill up the water reservoir I could get only around 3 L of filter water. I have a 4 L kettle so every morning I fill in 3 L water to the kettle I need to wait for another 10 minutes to top it up. The second issue is the design of the tap. I need to hold the button for 5 minutes while I'm also holding my kettle to fill up water. The process is tiring. It would be a better design to use a lever instead of a button. For the water quality, I'll vote for this product but for the process getting clean water, I hope there's something better out there. Worked great for the first week. On day 9, the water in the reservoir stopped flowing through the filter unless the reservoir and connected filter are physically held above the water level in the dispenser. Since it flows at such a slow pace, this is a tedious and time consuming way to filter the water.